Pack/Size: 24/4.5 oz. and 12/4.5 oz. 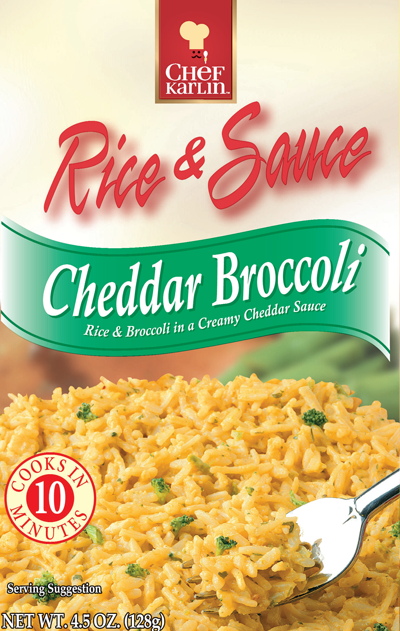 Ingredients: Enriched Long Grain Rice (Rice, Iron, Niacin, Thiamine Mononitrate, Folic Acid), Enriched Vermicelli (Wheat Flour, Niacin, Iron, Thiamine Mononitrate, Riboflavin, Folic Acid), Whey (from milk), Salt, Partially Hydrogenated Soybean and Cottonseed Oil, Autolyzed Yeast Extract, Corn Starch, Broccoli*, Onion*, Natural Flavor, Corn Syrup Solids, Cheddar Cheese (Pasteurized Milk, Cheese Cultures, Salt, Enzymes), Parsley*, Garlic*, Lactic Acid, Sodium Caseinate (from milk), Annatto (color), Mono- and Diglycerides, Caramel (color), Disodium Phosphate, Cream, Whey Protein Concentrate, Nonfat Dry Milk, Citric Acid.. In a medium saucepan, bring 2 cups of water, 1 tablespoon margarine or butter and contents of package to a boil. Boil over medium heat, uncovered, stirring occasionally about 10 minutes or until rice is tender. In 1½-quart microwave-safe casserole or bowl, combine 2 cups water, 1 tablespoon margarine or butter and contents of package. Microwave uncovered on HIGH 12 to 14 minutes, stirring every 5 minutes, until rice is tender. Stir.